A simplified 'needs' mod that adds easy to manage buffs when bathing. Adds bathing rooms to inns, washwater to cookpots, and placeable washbaskets for your player home or camp. Also build your own bath! If you would like to use my own assets from this mod, just drop me a line to let me know and give me credit. You must get permission from and give credit to any authors whose assets I have used. See main Description page for links. Redguard lamp from The Witcher by Oaristys. The Witcher meshes and textures are owned and copyrighted by CD Projekt and used with permission. 1.90 users can update by simply replacing old file by this one. - 7 type of Wash water (bonus are halved compared to soap). - Water is mandatory when you want to use soap. You can bath in all rivers. (based on SKSE water utility written by Mzin). Compatible with all DLC, Falskaar, wyrsmooth and any water mod without any patches. * "Clean & relax" (+5 speechcraft, +20 resist disease, +5% learning skill), require to bath in a bathroom, or "Clean" (+5 speechcraft, +20 resist disease) require to use a soap and bath in a river or "Refreshed" when you use wash water (+2.5 speechcraft, +15 resist disease) during for 4 real game hours. * Dirty (-10 speechcraft, -20 resist diseases, -10 sneaking) occurs 8 hours after your bath (maybe it will need an another step or to be adjusted). - Using different way to wash yourself induces different bathing animations. 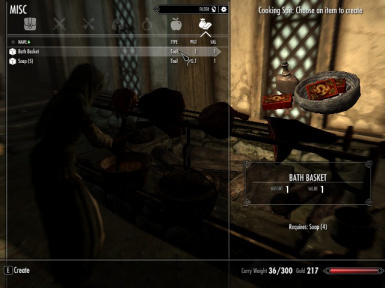 - All washbaskets in Inn open a merchant container where you can buy some soap and sell yours. - All washbaskets in your own bathroom or placable one open a shared container where you can store your soap and wash water (nothing else). More realistic and atmospheric lighting added thanks to TwilightStar! Added SKSE version of main file that includes Build-Your-Own-Bathing Room. Simple Bathing is a simplified 'needs' mod that adds a basic buff when bathing. 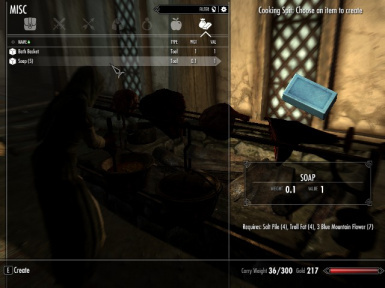 I love needs mods, and I always felt there was something missing when I stumbled freezing and starving into an inn – a bath! Of course there already is mzin’s great, full-featured Bathing in Skyrim, but for my teetering tower of mods it would be a script too far. So I made this simplified version – it adds a buff, but does no tracking or debuffs. You can use it when you want, and forget it if it’s not convenient. The scripts are extremely minimal – one only adds the buff spell on activating a washbasket, and the other fires in the NPC undress zone I added to the bathing rooms. This gives you a point to using a bath, without any script overhead. 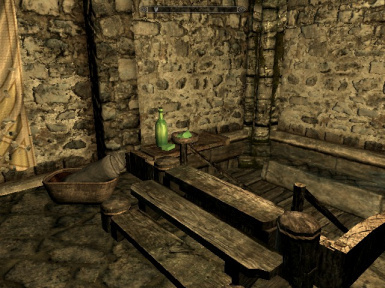 The mod adds bathing rooms to inns, washwater to cookpots, and placeable washbaskets for your player home or camp. The SKSE version also includes a buildable bathing room with a player-character undress basket. Most assets are vanilla - but version 1.3 adds some amazing Nordic wall carvings from Nordic Carving - Wallbaskets by mikeynexus. I just had to add at least one to most of the baths, it really punches up the decor. I've added Frostfall markers to each bath, so your character should warm up in the water. A bonus to disease resistance and health just seem to make sense for a clean mod, and for those of us that have mods that disable health regen (like I do) I added the buff to stamina. It’s 4 hours real time – so depending on your time scale, you’ll get a couple days or more game time out of the buff. Enough to wander off to some dungeon and back to civilization. Note the effects don’t stack, so washing again simply starts the clock again. Create it using the cookpot, and activate it right in your inventory. (You could drop it, if you really wanted to, but not required.) Like washwater in real life, it gets used up (disappears) with use. This will give you a similar, reduced buff as the baths in inns – if you think about it, it’s more of a sponge off-face washing sort of thing. So it won’t give you quite the bonus a full bath will. Thus you can wash in any interior with an operating cookpot, including NPC homes, bandit camps, and the like. And if you have camping mods such as Campfire or Campsite installed, you’ll be able to wash up using a cookpot at your own camp. And there’s more! I just know people will ask – 'but what about my player home?' There’s just no way I could patch every one, and what about your permanent camp? So my simple solution for that is to include placeable washbaskets that you can put in your player home or camp. Like the inn baskets, these are permanent and can be used infinite times. The buff will be the same as the inns. 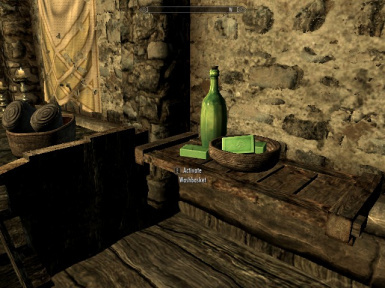 And for the discerning Dragonborn, there are a few fancier baskets for purchase at Belethor’s in Whiterun and Bits and Pieces in Solitude. By request: As an optional add-on, I have also included a placeable (and re-placeable) wooden washtub that uses the same script as the inn baskets, crafted and managed using Chesko's Campfire system. You could use this if you like making more permanent or well-appointed campsites, or you can place it in a player home as a rustic bath option. Find it in Misc files. Buy a scroll of instructions from select merchants that lets you place a trapdoor that leads to a new custom bathing room. Belethor's will have Nord and Noble versions, Bits and Pieces in Solitude will have Noble and Redguard, Sadri's Used Wares carries the Dunmer style, and some Orc blacksmiths will have an Orc version. 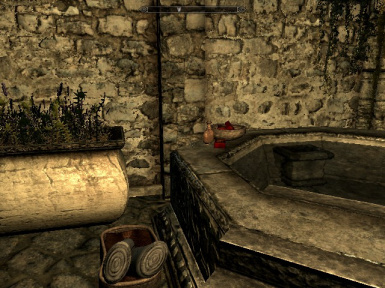 Various decor objects from some of the amazing modder's resources on the Nexus (credits below) make each bath unique. Note: The placement is permanent. When you build, the trapdoor will be placed directly under your feet, oriented in the exact direction you are facing. So use your player character as your guide for placement. (I recommend you make a save just before you build!) Building will take from 9-12 hours of game time, so expect to be tired and hungry after if you use needs mods. Your player character can also bathe in comfort! Toggle the "undress basket" (basket of armor or clothing) in each bathing room to unequip all items. Click again to re-dress. Now also re-equips your weapons and equipped spells. Interactive Wash Basins by simsim899 would work great with Simple Bathing, as it uses the same principle of a simple buff. This was the mod that really inspired me to make my own. Campfire by the inimitable Chesko allows you to build a campfire and thus cookpot/washwater almost anywhere. Kinaga’s Campsite also adds cooking pots to camps. Rusey’s wonderful Tentapalooza includes fancier placeable tubs, for those with more refined tastes. That already includes a small resist disease buff, but you can add my washbasket to it as well. Requires Campfire. You could construct your own shack with gezegond's neat Live Anywhere - Constructible Shacks - then add a bath to it! Should be overall compatible with everything that Showers in Inns works with – which is mostly everything. Compatible with iNeed - you can refill waterskins from the bath. The original RND was also reported to work for refilling waterskins and bottles - not certain if that will be the same for RND 2.0, I don't use it myself. Works great with More Tavern Idles and Interesting NPCs. Patch for CACO available in downloads (the soap recipe will use CACO's tallow and salt). Patch for InnCredible available in downloads. There are a few items added to merchants chests and merchant level lists – so if you have other mods that add to these, you’ll want to make a bashed patch with Wrye Bash. Not compatible with Perseids Inns and Taverns Realistic Room Rental Enhanced v1.8, but Basic v1.7 is fine. Does not require FNIS - the animation is a simple vanilla idle (WarmArms and WipeBrow). I recommend installing with Mod Organizer (or alternatively Nexus Mod Manager). If you have a mod that uses some of the same modder's resources, NMM may ask you to overwrite. Just say yes, they should be identical - if I made changes to any assets they will be in the clioshand directory. For best results, install after any mods that add items to the inns. Use a Bashed Patch for leveled lists. UPDATING an existing save to 1.3: Overwrite your existing main files with the newer update version. Any included script changes should be compatible with your existing savegame. Uninstallation: It's never recommended to uninstall a mod mid-playthrough. All mods with any kind of script leave traces in your savegame, even light ones like this one. Ideally, you will restore your archived save from before installing the mod. 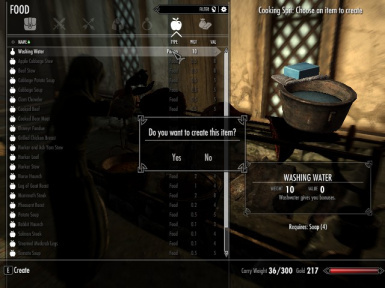 If you must remove without restoring an archived save, be sure you exit any cells from the mod or that have a placeable washbasket in them, and ensure you don't have any washwater/washbaskets/mod added stuff in your inventory. Remove mod with MO or NMM (or manually remove relevant files from your Data directories). 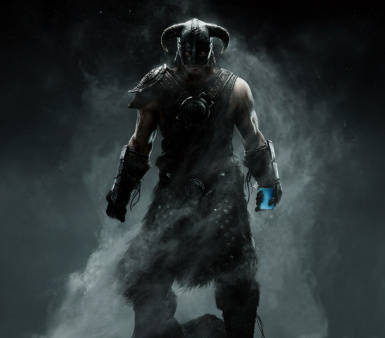 Then clean all scripts from the mod out with hadoram's Save Game Script Cleaner following this guide by icecreamassassin: http://www.nexusmods.com/skyrim/articles/50442/? I want to share freely with the community as others have so generously shared with us. But I also believe strongly in attribution. You pretty much need to know you have clear permissions for anything you want to extract from this mod, since they are combos of others’ resources. Everything else comes from free-to-use modder’s resources. HOWEVER you must give credit to any authors whose assets I have used. See the Credits list for an idea of where everything is from, or PM me. Also a big shout-out to TwilightStar who fixed up the lighting in the baths - it's much more realistic and atmospheric now. I just had to use Amelli’s excellent Insanity's Soap - Retexture – there’s a different one for nearly every inn! (SKSE version) I used the building scripts from gezegond's really cool Live Anywhere - Constructible Shacks for the mechanics to make the buildable baths. The Witcher meshes and textures are owned and copyrighted by CD Projekt and used with permission.